Dr. Zaius leads a group out beyond the edges of the Forbidden Zone with the intent of destroying Taylor’s discovery of the Statue of Liberty. After all, apes cannot allow such a monument to encourage the sacrilegious belief that humans have ever been anything other than the animals that they are. 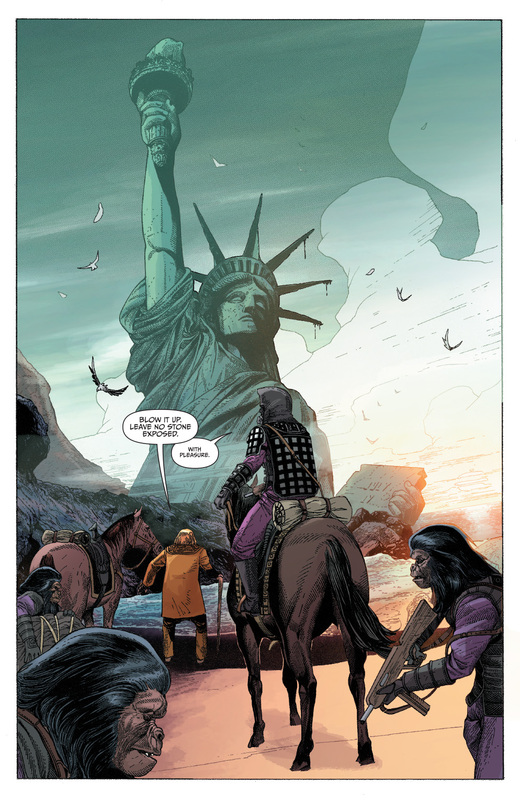 However, their exploration doesn’t stop at Lady Liberty. 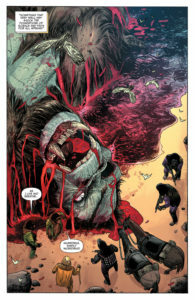 As the apes explore this unknown region a little farther, they stumble onto a discovery that could prove beyond any shadow of a doubt that Apekind is the apex species on the planet- the remains of an gorilla of mythic proportions. 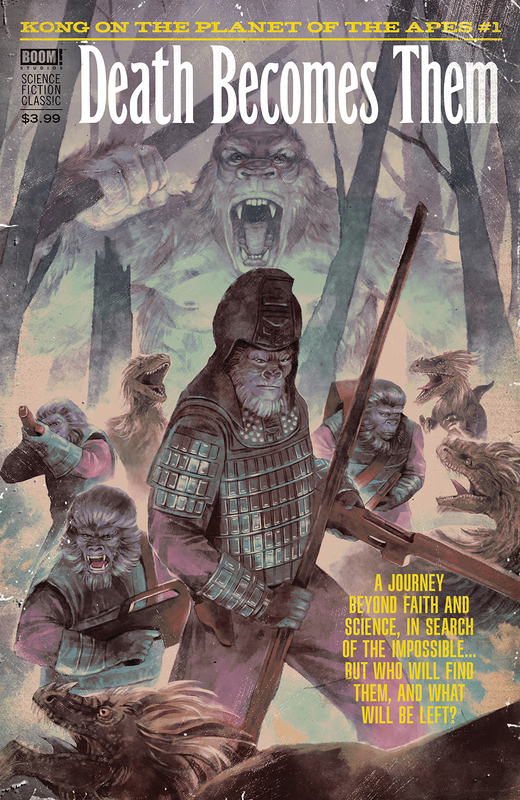 Having discovered this great ape, gigantic by any unit of measure, Dr. Zaius must now gather an expedition to track the origins of the monster, to determine if the remains represent a link in ape evolution or if it’s evidence of great ape gods walking the earth. It looks like the concept of “everything old is new again” has been embraced by the folks at Boom! and this time they’re going big. 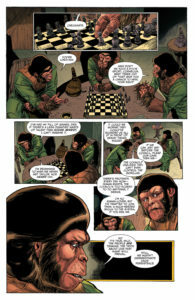 After their collaboration with DC Comics to bring us the Green Lantern/Planet of the Apes crossover mini-series, I suppose there was a room full of people sitting around trying to figure out “what’s next?” The answer to that question was to bring two long standing names together, and to do it do it in a way that fully embraces the nostalgic feels. 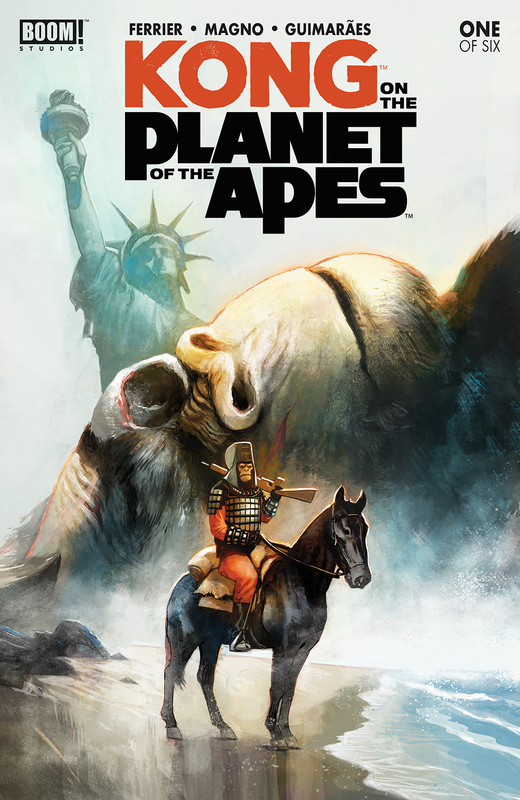 I grew up watching the original Planet of the Apes movies, starring Charlton Heston, Roddy McDowell, and Kim hunter. I also remember going to see King Kong- the one starring Jessica Lang and Jeff Bridges- in the theater. I had a bunch of the toys, and I’d be lying if I said that I never brought Kong and the Apes together… but it usually ended badly for the apes when Godzilla showed up (sorry, I always liked Godzilla just a little bit more). What I thought was great about this story is that it’s not based on any new interpretation of the old material. 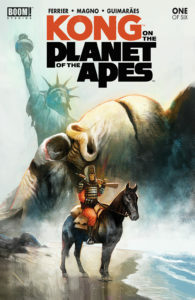 This could almost be a direct sequel to the original Planet of the Ape movies, with all of the characters and concepts coming right out of 20th Century Fox’s 1968 production. Ryan Ferrier should be commended on his writing here, because he must’ve sat through a few viewings of those old flicks in order to get it all right. 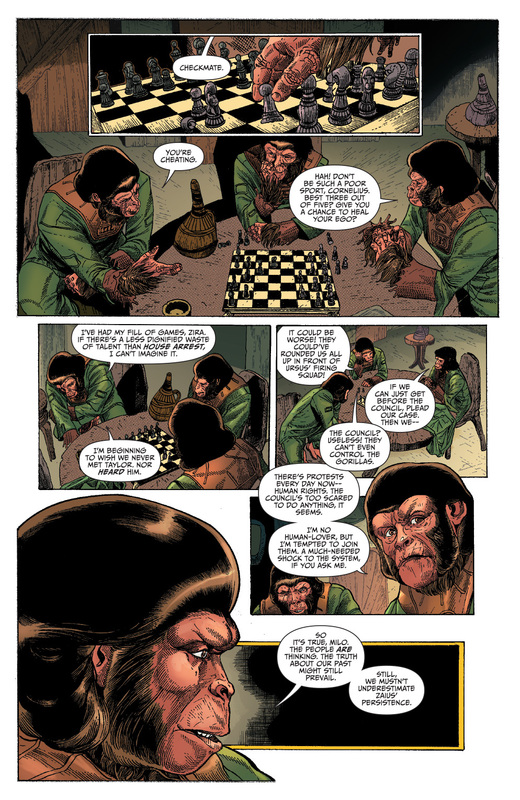 He’s put together a story that comes across as plausible- so far as that may be in this context- and he’s upped the ante a bit in regards to the ape society. 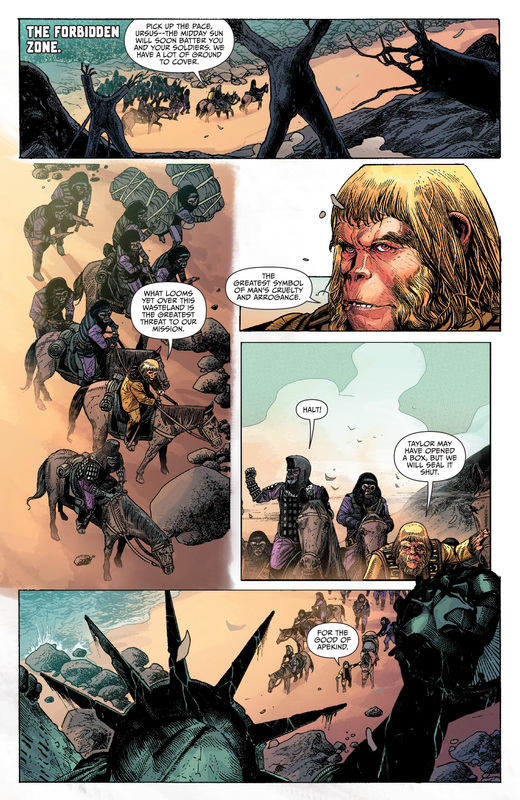 We no longer have just one city of apes, but are introduced to a faraway group living on “Warm Water Island”… what we know as Kenya, East Africa. 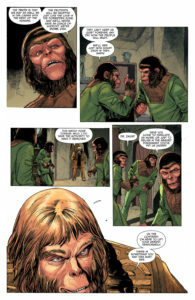 Warm Water is Zaius’s first stop along the way as he follows a secret map to their final destination: Skull Island! Likewise, Carlos Magno deserves some heavy props for this project. For an artist to take on the challenge of adapting the visual style of a movie, particularly a movie from 1968, and not make the whole thing look ridiculous is a feat worthy of sainthood. You hear that, Carlos? One miracle down, two to go. With Alex Guimaraes on colors, this team has captured a pretty sharp environment that doesn’t just look like they Photoshopped anything from movie production stills. And when Zaius and company get to Africa, the change in wardrobe and background has me really wanting the apes to visit Scotland… something about a bunch of apes running around in kilts kinda tickles me. 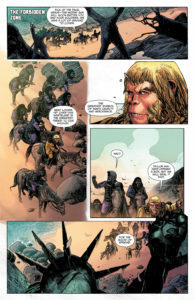 For now, I’m really looking forward to getting more than the bare glimpse of Skull Island that we got on the last page of this opening issue. Like with most crossovers, there’s more than a little bit of fanboy pandering going on here. The trick isn’t to avoid that, but to embrace it and make it something that pays attention to the source material without looking it’s just copying and pasting. 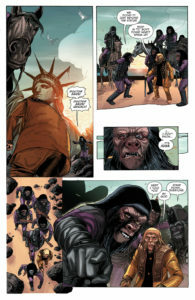 I think they’ve managed that here, so pick up the first issue of Kong on the Planet of the Apes and see for yourself. 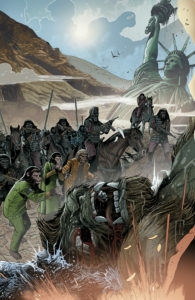 Admit it… you really wanna see Kong wailing on a bunch of gorillas on horseback, don’t you?